Just what you would expect from this well-respected science writer for children. Plenty of information for anyone through 6th or 7th grade, but not too hard for a read aloud for younger kids. Very informative, and pictures are great. I was hoping it would be good for an eleven year old, not sure he enjoyed it as much as I did. 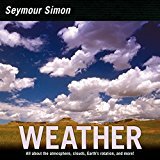 This is a good basic book on weather. I thought it might be more advanced than it is, but this is a good start for young students interested in meteorology or for anyone looking for basic information.